The concept of TDS on GST was initially introduced in the Income Tax Act and has now been introduced in GST as well. The purpose of introduction of TDS on GST is only to enable the govt to have a trail of transactions and to monitor and verify the compliance.It acts as a powerful instrument to prevent tax evasion and expands the tax net, as it provides for the creation of an audit trail. 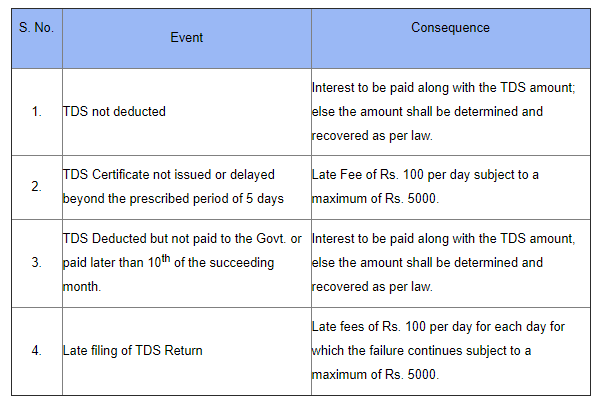 No TDS to be deducted if the payment is made by a person who is not mentioned in the above mentioned list. TDS on GST is only required to be deducted where the payment made or credited to the supplier is done by the above mentioned category of persons. where the total value of such supply, under an individual contract, exceeds two lakh fifty thousand rupees. *Explanation :- 1% TDS is required to be deducted under both the CGST and the SGST Act and therefore the total TDS to be deducted is 2%. In case of an inter-state transaction, IGST would be levied and 2% TDS would be levied in this case as well. If the Contract Value does not exceed Rs. 2.5 Lakhs, no TDS is required to be deducted. But one important note that while determining the applicability of TDS on GST – it is the individual contract value which would be considered irrespective of the total no. of contracts. This can be explained with the help of an example. Ex- 1:- Mr. Ram enters into a contract of Rs. 2.25 Lakhs with a Local authority to provide Income Tax Advisory. He also enters into a contract worth Rs. 1 Lakhs to provide GST Advisory. Ans :– The total value of services provided is Rs. 3.25 Lakhs which is more than Rs. 2.5 Lakhs. However, in this case – the provisions of TDS on GST would not be applicable as the value of each contract is less than Rs. 2.5 Lakhs. Ex- 2:- Mr. Ram enters into a single contract to provide services worth Rs. 4 Lakhs. He receives Rs. 2 Lakhs as advance on the month Sep, 2018 and the balance Rs. 2 Lakhs on the month of June, 2019. Ans :- The provisions of TDS on GST will get applicable as the contract value is more than Rs. 2.5 Lakhs. TDS on GST would not be applicable if the Location of Recipient is different from the Location of Supplier and the Place of Supply. Ex- 1:- Gujarat Govt. enters into a contract worth Rs. 3 Lakhs with Hotel Taj – Maharashtra to rent space for the purpose of conducting an event in their hotel. Ans :- The provisions of TDS would not apply in this case irrespective of the contract value as the Place of Supply and Location of Supplier is different from the Location of Recipient. Place of Supply – Maharashtra. Location of Supplier – Maharashtra. Location of Recipient – Gujarat. Eg 2:- A vendor registered in Gujarat provides services to the Maharashtra Govt worth Rs. 4 Lakhs. Ans:- The provisions of TDS will apply in this case. Therefore, while determining the applicability of TDS on GST, it is very important to determine the place of supply. As per Notification No. 50/2018 – Central Tax Dated: 13th September, 2018 , For the purpose of deduction of tax specified above, the value of supply shall be taken as the amount excluding the central tax, State tax, Union territory tax, integrated tax and cess indicated in the invoice. This means TDS shall not be deducted on the CGST, SGST or IGST component of invoice. The amount of TDS deducted should be deposited with the govt by the deductor by the 10th of the next month in Form GSTR 7 through the online portal. The deductor would be liable to pay interest if the tax deducted is not deposited within the prescribed time limit as mentioned above. A TDS Certificate would also be required to be issued by the deductor (the person who is deducting the tax i.e. the recipient) in GSTR 7A tothe deductee (the supplier whose payment is being deducted) within 5 days of depositing the TDS with the Govt. TDS will an automatic reflection in the electronic ledger of the deductee (supplier) once the deductor files his/her returns. The deductee can claim credit in his electronic cash ledger of this tax deducted and use it for payments of other taxes. The concept of TDS under GST is a fairly new concept and has initially been implemented only on a small no. of assesses at a flat rate of 2%.